A Highlands County Sheriff's SWAT vehicle is stationed in front of a SunTrust Bank branch, Wednesday in Sebring, Fla., where authorities say five people were killed in a shooting. "Today has been a tragic day in our community," Hoglund said. "We've suffered a significant loss at the hands of a senseless criminal doing a senseless crime." 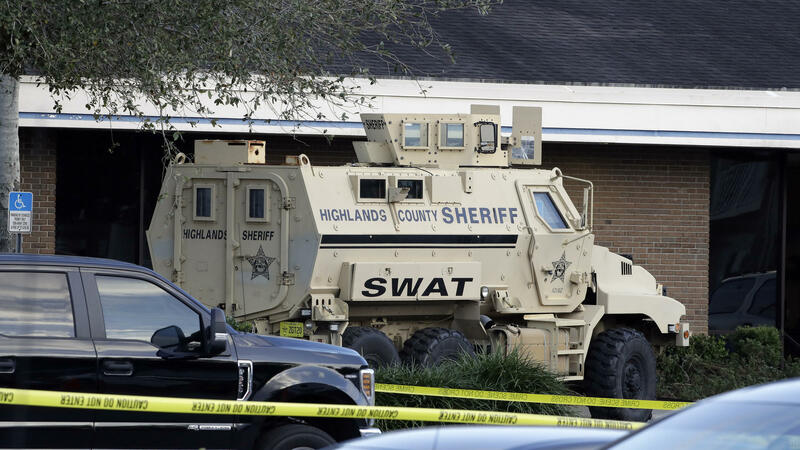 At approximately 12:36 p.m., Sebring police and Highlands County Sheriff's deputies responded to a SunTrust bank branch after a man called police dispatchers and said he had fired shots in the bank. Responding law enforcement agents began negotiating with the barricaded shooter, trying to get him to surrender. A SWAT team from the sheriff's department entered the building and continued to negotiate with the gunman until he eventually surrendered. Video footage from the scene showed a standalone, low-slung brick building with apparent damage to one of its main entrances. Police didn't release information about the victims, saying they would provide more details on Thursday morning. They said that an investigation is ongoing, but that there is no further danger to surrounding areas; local schools were locked down during the incident. Later in the day some details about the suspect emerged. Xaver was an online student of Utah-based Stevens-Henager College from September until December 2018 when he withdrew. He was also a trainee prison guard between Nov. 2 and Jan. 9 when he resigned, according to Florida Department of Corrections records cited by The Associated Press. "This is an individual that needs to face very swift and exacting justice," Florida Gov. Ron DeSantis said at the news conference. Sen. Marco Rubio, R-Fla. called the shooting "tragic" in a tweet. "We are deeply saddened by the tragic shooting at our Sebring, Florida branch this afternoon. We are working with officials and dedicating ourselves to fully addressing the needs of all the individuals and families involved," SunTrust CEO Bill Rogers said in a statement. "Our entire team mourns this terrible loss." Authorities have not yet suggested a possible motive.